Oh and tottering. Lady M has started walking. She waddles all over the place now, which means I can't very well sit with my laptop, trying to edit, because she will cause all kinds of chaos in the tiniest amount of time if left to her own devices. 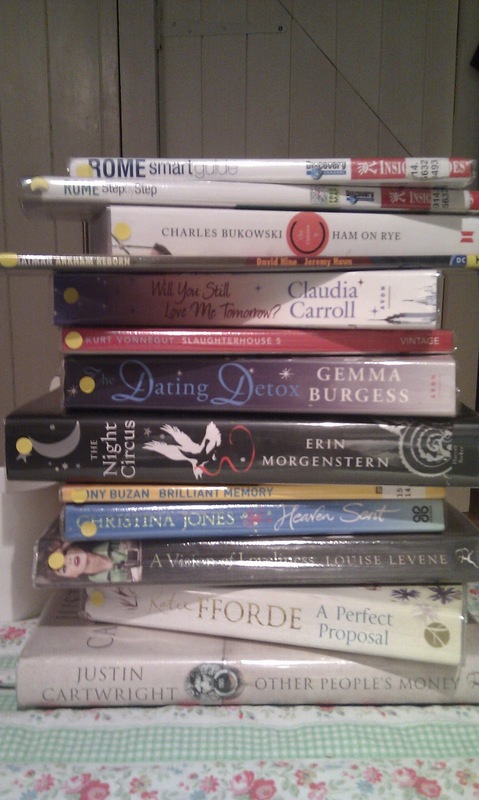 Speaking of tottering, my TBR list is ridiculous. 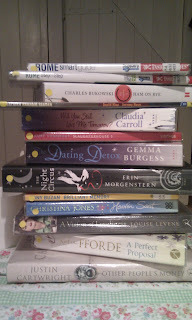 Every time I go to the library, I add a few more books to the stack. I have been staring at the beautiful cover of 'The Night Circus' for nearly a week now but I daren't open it quite yet. I know I will need a full day to devour it, cover to cover, without distractions. Alas, it will have to wait until the end of next week when I am child free (and have read my book group book, which is hiding behind some TBR books, afraid to be picked up (it probably assumes I won't like it very much as I have been disenchanted with the last few book group books). Baking. Aah yes. My Nigella books suddenly call to me whenever it is time to edit RaL or draft a synopsis or write a cover letter to an agent. Cleaning. Not that I want to come across as slovenly or anything but I feel the urge to clean most when I am either cross or about to sit down and do some writing type work. Organising. This is a classic DA. I must organise my spice drawer/the pantry (that makes it sound like a I live in Downton Abbey or Nigella's house - this is far from the truth)/my wardrobe/Lady M's wardrobe (she has one. It's bigger than mine. Way bigger)/clean my car. Okay, that last one has never happened. I don't clean cars. That's for husbands or dads to do. Sexist, moi? Making space on the Humax. Because I need to keep it below 25% full. It's pathological, okay? I can't help it. I have OCD. Catching up on all my bookmarked blogs. I might come across something really important that helps with editing/synopsis writing/etc. Twitter. I don't think I need to say anything else. I can't be missing out. I think I need to wean myself of it. Or maybe just limit myself to checking it, oh, perhaps only ten times a day. Oh yes, Lady M is also teething like a good 'un. Her first two teeth came through without us even knowing about them (until she bit the Chardmeister on the toe - then we knew about it). Fantastic, we naively thought. This is going to be a doddle. Yeah, not so much. She doesn't sleep much in the day now and wakes up between the hours of pitch black and dawn chorus. It is exhausting. And doesn't leave much time for writing type homework. Especially when I have to fit all my DAs in (and some exercise due to the aforementioned baking).